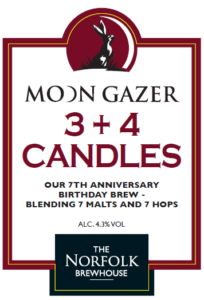 I find it hard to believe that it’s a year since I wrote about our last birthday celebration brew – 6 Candles. But another year is indeed over at Brewhouse madhouse and so – not that we need it – there’s an excuse to brew up another new birthday brew. Now, you may think that the ingenious name for this year’s brew would be 7 Candles – and that wouldn’t have been a bad shout. However, the opportunity of calling it 3 +4 Candles was too good to miss in an effort to get pubs across Norfolk and Suffolk echoing with cheery Ronnie Barker impressions. The old ones are the best still! One tradition which we have stuck to however is that the number of malt and hop ingredients have to match the anniversary – so, that’s 7 different types of malt or grain and 7 different hops. The result is a session IPA with a great depth in flavour, good fruitiness with balanced and appealing hops. Light amber in colour at 4.3% abv it is a smooth, easy drinking, moreish session beer. The seven malts and grains which we have used are Maris Otter, Caramalt, Crystal 150, Amber, Brown a touch of wheat and a healthy dollop of oats. As for the hops we will be using some modern classics to give good fruit flavours and aromas without being over powering and allowing the malts to still add plenty of character. The hops we have used are; Simcoe, Taiheke, Citra, Mosaic, Olicana, Aurora, and El Dorado. The brew will be heading out to pubs later this week – so, do please look out for it and enjoy. Without you beer lovers we wouldn’t have made it to 7, and hopefully there are a lot more birthday brews to come yet.